Earlier this year, I spent 2 full days with squash legend, former World #1 and current world #8 David Palmer… What I learned from him has added 1-2 points to my squash game ALREADY. We ALL need coaches, advisors, mentors, but most people focus on LACK rather than opportunity and ABUNDANCE. The ABUNDANCE they can create. The ABUNDANCE that is within reach. The ABUNDANCE that is right there, but out of sight because the focus is on something else. The ABUNDANCE that is literally UNLIMITED and BOUNDLESS. The ABUNDANCE that turns work into play and a life into a lifestyle. The ABUNDANCE that is ultimate freedom and independence. The ABUNDANCE that is the foundation of peace and serenity. The ABUNDANCE they will never have – UNLESS they shift their focus and mindset. You get what you focus on… So choose your target carefully! This Is What A Silver Medal Looks Like! Published on March 8, 2009 in Squash. 0 Comments Tags: Marc Dussault, Mindset Of A Champion, Silver Medal, Squash. 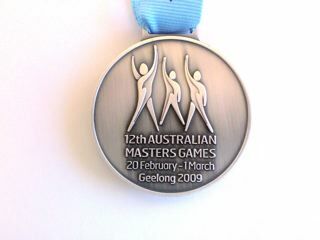 I published a post last week about my Silver Medal Victory in the 2009 Australian Masters Games and quite a few people sent me congratulatory e-mails and wanted to see what the medal looks like, so I took an up-close picture just for you! Thanks for all the great encouragement and don’t forget to go for YOUR GOALS and DREAMS! Published on March 6, 2009 in Motivation, Positive Thinking and Squash. 0 Comments Tags: Law Of Attraction, Malcolm Simons, Marc Dussault, Mindset Of A Champion, Squash. By now, you know all about the Exponential Mindset’s ability to Unleash The Exponential Potential that is within you and that the Law Of Attraction has a lot do with providing you with what you need, when you need it. A MasterMind Group is taking that concept and philosophy to the next level. 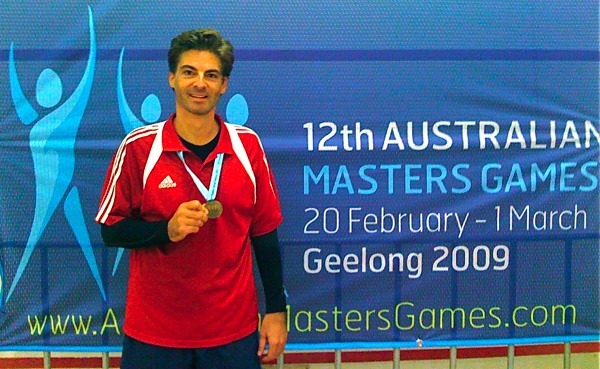 Today’s post is about a guy I met at the 2009 Australian Masters Games, his name is Dr Malcolm Simons. Truth be told, Malcolm contacted me BEFORE the games because he heard that I was presenting “The Mindset Of A Champion” and was unfortunately unable to attend. He apologised for missing the presentation but said he was going to come watch me play one of my matches (squash) which he did. Playing Squash In The Rain Is Messy! Published on March 2, 2009 in Motivation and Squash. 8 Comments Tags: Marc Dussault, Mindset Of A Champion, Olympics, Squash. I don’t know what you did last weekend, but I spent it with 7,500 other athletes competing in 63 sports, across 70 venues over 10 days at the 12th Australian Masters Games in Geelong, Victoria. That’s not quite the same number of athletes as the Olympics, but it sure is close! I competed in the Men’s 45-49 age category in Squash. My competition started bright and early on Friday morning with a 9:00 AM game that I won 9-0, 9-1 and 9-0 followed by a mid-afternoon match I also won 9-2, 9-1 and 9-0. What a start to the competition! My third match of the tournament was on Saturday morning, I won that one 9-2, 9-2, 9-4, putting me into at least a Silver Medal position and into the Gold Medal Match on Sunday. This was the confirmation I needed that the drills and routines I’d been focusing on are working. I explain in my Mindset Of A Champion Program that you either win now or win later – if you win now (during training) you won’t necessarily win when the competition comes around. By practicing what you CAN’T DO very well, means you’ll lose points now, but you’ll start to win – hopefully in time for the upcoming tournament – later. The Gold Medal Match didn’t go my way at all, I lost 9-6, 9-2, 9-4. I spent two hours writing a detailed synopsis of the Gold Medal match (terrible refereeing), but have chosen not to include it here, because out of context, no matter how it’s written, it appears like a poor loser winging about losing which isn’t the point. There are countless lessons learned – the post was originally 4 pages long. So instead I’ll simply tell you a story from a high jumper who competed at the Olympics (not sure which one). It rained at the Olympics. I will start ‘playing squash in the rain’ so that I am ready the next time it gets messy on the court! Published on February 14, 2009 in Motivation and Squash. 0 Comments Tags: Elite Athlete, Marc Dussault, Mature Athlete, Mindset Of A Champion. How To Uncover Your Success Clues: Practicing for the sake of it is not effective if you are a committed athlete. A handful of strategies will be revealed to enable you to ‘coach yourself’ and/or help others assist you in the quest to improve as quickly as possible. Leveraging What You Don’t Know You Know: Every competitive athlete knows what it feels like to be ‘in the zone’. This single technique will enable you to recognise what you do whilst in the zone so you can get back into it ‘on command’. Competition Preparation: Make sure you absolutely ‘peak’ at the right time, with the winner’s mindset as well as re-create your success combinations and triggers. This is a 2-hour session to make sure we have time to get into the details that make all the difference and allow for questions and answers. The audio CD of the Mindset Of A Champion: An Introduction, recorded at Geelong’s Re-Creation Health Club on Saturday 31 January. apply the principles and strategies in your training and competition. Your own copy of Dr Marc Dussault’s book “How to Create a Fun, Effective and Powerful MasterMind Group to Catapult You To Exponential Success” that will show you step-by-step how to get others to help you achieve better results in everything that you do. The audio CD of the Mindset Of A Champion: Peak Performance Strategies For the Elite and Mature Sport Athlete, to be recorded when you attend. The full word-for-word transcript of the Mindset of A Champion Presentation: Peak Performance Strategies For the Elite and Mature Sport Athlete so you can focus on the presentation and not worry about taking notes. In the first presentation, one person took 4 full pages of notes! Published on October 21, 2008 in Squash and Strategy. 0 Comments Tags: Focus, Improvement, Losing, Marc Dussault, Marketing Autopsy, Maximum Results, Personal Development, Vortex Of Mediocrity, Winning. I played an ‘unorthodox’ player today who wasn’t better than me technically, but came up with the non-tradition shots that I couldn’t respond to due to lack of match experience. This was the one thing I couldn’t avoid this year because I haven’t played a single tournament in the last two years. With my travel schedule with a lot of weekend events, it just wasn’t something that was possible.. I lost in three games, knowing that there is NO CHANCE WHATSOEVER that this will happen again next year. NONE, NADA, ZIP, NYET, ZERO. You need to know what arena you’re playing in – just like a boxer that gets in the ring, hits and kicks below the belt are not allowed. Today’s match was more of a street fight than a boxing match. I ‘box’ well, now I have to learn to ‘street fight’. I knew that, but it’s so much more tactile and ‘real’ when you get off the court realising you lost the game rather than the other person ‘winning’. In business, if you’re in an industry with scrappy players, you need to know the ‘rules’ people are playing by and elevate your game accordingly as I explain below. Strategy, maturity and vision are extremely important, especially at times like these. Like Superman, I knew that if someone showed up with Kryptonite, I had no defence. It’s the luck of the draw and I accept that – THIS YEAR. Next year’s a totally different story. If you know your strengths and weaknesses in business, you can try to avoid your Kryptonite as much as possible, but if you want REAL, ULTIMATE SUCCESS, you must find an antidote. Otherwise the ultimate prize will never be yours. Find out what to work on to get the MAXIMUM results. I now know that my fitness is not an issue – I am as fit as I need to be to playing in the top ’32′. I need to focus on my racquet skills and match experience. The former I can work at on my own, the second will require considerable travel to compete in tournaments to get the experience I need. The analogy in business is that as I explained in yesterday’s post “Where you stack up NOW makes a difference LATER“, knowing your strengths and weaknesses as they are now can dramatically improve the speed at which your results will emerge. To stay with the squash analogy, if I fix two or three technical issues with my strokes and/or shot selection, I will start to win games that I am currently losing. If I don’t and just focus on fitness, the only thing that will happen is that I will sweat less after losing the game that I should have won. This is much easier said than done. Without a Business Mentor or a tool like our Marketing Autopsy™, it’s hard to know WHAT TO FOCUS ON TO GET IMMEDIATE RESULTS. With all that in mind, I leave you with one thought. I hate to lose, I really do. But what I hate more than losing is NOT WINNING. Winning requires that you lose to learn the lessons that make you better. Once you let go of your ego (yes, I know that is not an easy thing to do…) and re-direct your focus to IMPROVEMENT, then and only then can you get back on the ‘winning track’. I was speaking to a top grade player and she mentioned that everytime she got to the next higher grade, she had to run around like crazy all over again because what worked previously no longer worked at the new, higher standard… That is a priceless insight that’s hard to find anywhere else but at a world-class competition, straight from the mouth of a champion! That means I have to MAINTAIN my fitness BECAUSE I am going to need it when I get to the next ‘level’! If you know me well, you know today has been a tough day for me, but what keeps me resilient and always ‘setting a new standard’ as Tony Robbins says is that with excellence (outstandingness or extraordinariness in Tony’s terms) comes a sense of confidence that mastery gives you the ability to DICTATE the game. That is what I am striving for and I know without a doubt I have the talent and ability to ascend to that level. On a day like today, that’s what keeps me going. I feel the pain, hurt and disappointment like anyone else would – I wanted to win today, but I lost. I lost because I didn’t have the level of mastery to DICTATE the game. But I know what I need to do to get that level of Mastery. That’s what I came to discover and it’s CRYSTAL CLEAR to me know – and yes the crystal was green today… very funny! That is what I didn’t know I didn’t know that I need to know! By the way, using a metaphor like Superman and Krytonite helps me deal with the situation as I evaluate and assess my progress. Without metaphors, the Vortex Of Mediocrity™ can have a devastating and debilitationg effect. Not in the top 10… YET! Published on October 20, 2008 in General, Positive Thinking and Squash. 1 Comment Tags: Champion Mindset, Dignity, Discipline, Excellence, Integrity, Marc Dussault, Mastery, Perseverance, Personal Mastery, Think Like A Champion, Winning. Play with class, dignity and sportsmanship because when the game is over, it’s over. This guy made losing ‘fun’ if that makes any sense and I HATE TO LOSE! What works for one ‘class of players’ doesn’t work at the top end of the rankings… That’s very important business to learn in business – SOHO, Sole trader, ‘one-man-show; just won’t cut it when you start to get serious and want to land the bigger accounts. There is no substitute to KNOWING, FEELING what the competition is like, LIVE AND IN PERSON. A master is a master – there is nothing more exhilarating than learning the BEST from the BEST. That’s why I know that our Bootcamp is a priceless opportunity for people to get an experience they can’t get anywhere else. So there you have it, my lessons from today’s match which ended 0-9, 2-9 and 3-9. With handouts it’s very deceiving – I actually played quite well, but not good enough to win. We had 15 to 20 really good rallies that I was very happy with – for now. With this experience I now know what to aim for. I now know, without a doubt, how good I can really be. This is the first time I saw myself in another really, really good player. That is the GIFT I take with me as turn the page and focus on tomorrow’s match! If you’re wondering why I picked up squash in my mid thirties, you’d have to read my book “Get The Best Business Results With The Least Amount Of Effort” to get the full explanation of the Circle Of Influence™, but in simple terms, I use squash to expand my circle of influence by design. I am forced to deal with issues of discipline, perseverance, challenge, confrontation, limiting and empowering beliefs, self-discovery, health, nutrition and fitness to name just a few. For example, when I was in my twenties, I ate anything I wanted and didn’t care about ‘nutrition’ and certainly didn’t understand the biochemistry of health at all. Squash has forced me to focus on peak physical performance that is enhanced with mental self-mastery. I am now an avid reader of mind-body, eastern-western medicine judging on RESULTS that I can produce for myself and my ‘inner circle’. It’s made me feel 10 years younger with vital health and energy that I otherwise ‘never’ would have discovered. Winning is not necessary for the EXPERIENCE to be life-changing and unforgettable. Once again, don’t forget the difference between the OUTCOME and REWARD. I can’t make this point too strongly. Published on October 19, 2008 in Squash. 1 Comment Tags: Discipline, Marc Dussault. My first International Squash Match ends in… victory! I played really well against a formidable opponent. I got off to a quick start in the first game with my serve that was quite effective today. From 8-2 down, I came back playing MY GAME WITH DISCIPLINE. I knew if I stuck to MY GAME, I could win. It took time, but I ended up winning 10-8. The third game was a lot closer than the first 2 and I varied the pace to upset his rhythm – that worked to give me confidence even though he got an early lead. I knew that DISCIPLINE would win the day. At 7-7 I engaged my secret ritual and brought it home. I have to admit I am proud of myself and have to give a shout out to my training partners – Nick, Michael, Ken and Simon as well as a special mention to Paul from Adelaide – he’s knows who he is… His tips made the difference today. Tonight’s match is with a top 8 seed player and I am going to give it my best shot. Stick to the knitting – DO WHAT WORKS when you need it most. Preparation is something you can always fall back on. Without it, you’re lost. Discipline and strategy wins the game when the opponents are of equal calibre. You want to make sure you WIN every game or at least not LOSE it. You only LOSE it if you don’t play your best. If you play your best and the other player WINS, that’s part of sport – you just don’t want to LOSE what you could have WON. As I teach in my book “Get The Best Business Results With The Least Amount Of Effor“, I took 3 pages of notes and distinctions about what I did, didn’t do, what worked and what didn’t work. There is no other time when those thoughts and ideas will clearer within my Reticular Activation System than RIGHT NOW. It’s a priceless strategy to ensure your on-going progress and improvement. Marc Dussault’s Personal Mastery Blog Launched! Published on October 15, 2008 in Squash and Vision and Planning. 6 Comments Tags: Anthony Robbins, Champion, Champion Mindset, Marc Dussault, Peak Performance, Personal Development, Personal Mastery, Results, Tony Robbins, Winning. Yes it’s here – my Personal Mastery Blog! Why not add the PERSONAL component to triangulate the Exponential Mindset™? I wasn’t ready until now AND I wanted it to be launched commemorating my entry into the 2008 World Masters Squash Championships in Christchurch, New Zealand. Yes, if you don’t know, this is my first international competition after winning an Open Men’s B Championship in my very first squash competition in 2005 and my first Master’s State Divisional Championship that same year. It’s going to be fun. LITERALLY. This year is all about surveying the terrain, determining where I am within the top 100 to determine where I want to be NEXT YEAR when the Championships are in my home town of Sydney, Australia! In fact next year it’s the World Masters Games that include ALL the other sports! It’s an event even BIGGER than the Olympics due to the sheer number of competitors. NEXT YEAR is when I want to ‘peak’. That’s what THIS YEAR is all about -> NEXT YEAR’S COMPETITION. I hear it all the time in business – everyone wants to make a quick buck TODAY. They rarely think of the consequences, costs and risks of such a short term strategy. In my case, this is an ‘open draw’ which means the luck of the draw will determine who I play. I can end up playing 5 players who are way, way better than me. I have no ‘say’ in that whatsoever. That’s just the way it happens. NEXT year it’s ‘divisional’ which means the draw is set according to ability, so unless someone outright cheats, players of ‘equal’ ability compete to win their ‘division’. That’s what I plan to do – determine where I am NOW in the top 100 and set my sights on X positions higher NEXT YEAR. In business it’s no different. If you plan to try to win ‘NOW’ and don’t know the rules in play, how can you possibly EXPECT TO WIN? If you just took a little longer to analyse the situation and ask a DIFFERENT QUESTION, you’d get a different ANSWER. In my case, my ultimate outcome is that I want to get to play my BEST squash before I turn 50. Once the DECISION has been made (WHAT), then and only then do I figure out HOW I am going to achieve that. I need ‘match experience’ and I also need to know how good the top 100 really are. I need to get on the court and slug it out to see where my strengths and weaknesses are WITH players my age – back home, everyone I play is younger and fitter than I am, with one exception (more about him later). There is NO SUBSTITUTE to being here. But I am not here to WIN – I am here to PLAY MY ABSOLUTE BEST. You know what I’m talking about consciously or subconsciously. I want to PLAY MY BEST so that I know what to IMPROVE for next year. If I came here just to win, I would have reinforced really bad habits that might have worked to improve my chances to win NOW, but would reduce my chances to ‘peak’ next year. I’ll give you an example. I do what’s called ‘breaking my wrist’ on my backhand swing. It reduces the power I can get from the stroke. If I just wanted to ‘win now’, I would keep breaking it and would be playing ‘better’ right now. By not breaking my wrist, I am not as ‘good’ right now as I could be, but by NOT doing it I will have SOLVED the problem by the time next year’s competition comes around. If I kept breaking it NOW, it would take me MONTHS of practice to undo the accumulated ‘muscle memory’. In business the same thing applies. Often, I really, really want to help someone, but their bad habits are so ingrained that after 10, 20, 30 or even 40 years that they are too hard to change and he/she doesn’t have the discipline to create a NEW, BETTER HABIT. In reality it’s not as much about discipline as it is VISION – seeing beyond TODAY to lay the foundation of a BETTER tomorrow. I call it a decision-making horizon. So there you have it – the FIRST POST of my Personal Mastery Blog. Two years in the planning, it’s finally here! Mine is to PEAK at playing squash before I am 50. There are several reasons for this. I learnt to play squash in my mid to late thirties when I came to Australia in 2000. I had played some tennis and racquetball in my twenties, but neither competitively. Squash is a very unforgiving sport. The second bounce of the ball happens VERY, VERY quickly REGARDLESS of age. In fact the older the players, the LESS they WANT to run and the MORE they place the ball where you’re not. Experience is actually rewarded by skill, patience and strategy. Playing at the international level requires the penultimate level of dedication. I was not willing to make that investment for this year’s competition, but plan to make it NEXT year. As I often teach, there are only 168 hours in a week and EACH HOUR has a VALUE. Squash was NEAR the top, but NEXT YEAR it has to be at the very top, otherwise I won’t ‘peak’ and get to be my ‘best’. The opportunity cost factors into the equation – more on this in a future blog post. I know that traditionally, 50 is a milestone that adversely affects squash skills: reduced peripheral vision, focus and other eye sight related symptoms, mobility and of course endurance and stamina. YES I KNOW that many/most of these can be counter-acted, but they are forces of nature that still need to be respected for what they are. 50 is another milestone for me. It’s when I plan to become a ‘global citizen of the world’ living and traveling with Monica while working on multiple continents – my training regimen will be adversely affected, but the VARIETY of people I will play will compensate for it. So if I have peaked by then, as I plan to, I will be able to extend that ‘competence/capability’ for several years – It’s called getting past the Vortex of Mediocrity™, one of the many concepts that I will be exploring in this Personal Mastery Blog. If you want to wish me luck, please ‘Dussault’ by adding comments to this blog as the DAILY entries are posted. That will totally make my day and my experience that much more special! Throughout the week, channel positive thoughts and energy to me – squash, like many other sports requires luck. All the shots that are up count even when they are hit off the frame… I need and want ALL THE LUCK you can send me!